For Hackney College in London, a Blanc de Bierges amphitheatre provides a stunning focal point. The origin of the amphitheatre can be traced back to the ancient Romans, where large central performance spaces surrounded by ascending seating, and were commonly used for spectator sports. These compare closely to the modern open-air stadium. 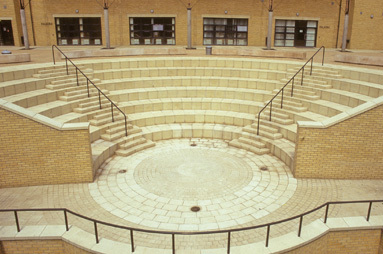 Nowadays, the principles of the amphitheatre can be employed as an elegant yet practical solution to a level change, or as used in Hackney College, as a feature in its own right. 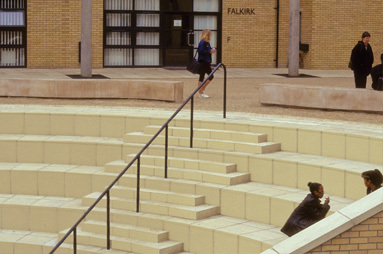 Unifying the college walkways provides a pleasing focus with the added value of acting as a ‘social’ space: a feature popular with students. In our close association with leading architects, we uncovered a dissatisfaction with the relatively restrictive construction of amphitheatres. In response to this, Blanc de Bierges have developed the AmphiSystem™, a unique system is designed to cut restrictions to provide cost effective practical flexibility and easy installation. AmphiSystem™ is based on modular deflections, to allow radii from 2.3m up to 13.1m to be accommodated. With increments of 0.9m the system is designed to offer flexibility and easy integration with other Blanc de Bierges products – as demonstrated at Hackney College – blending seamlessly with Blanc de Bierges paving, modules and other features. For details on the Blanc de Bierges AmphiSystem™ click here.